My visit to Izumo Taisha shrine fell in the weeks before Kamiarizuki, a good time to curry favor ahead of the gathering of the gods. Many people, and perhaps even a kami or two, reach the shrine via the Sunrise Izumo, a 12-hour overnight train from Tokyo with relatively few stops along the way. Despite the arduous journey, the gravity of Izumo Taisha in the national psyche compels people to pack these trains, not just for the month of the gods, but throughout the year. I arrived at midday during a serendipitous break in the stormy weather that the Sea of Japan is famous for, but a roil of Stygian clouds ringing the horizon in every direction reminded me of the gods’ caprice. It was a Sunday, and a varied assortment of pilgrims and tourists scurried back and forth, chatting and snapping pictures. 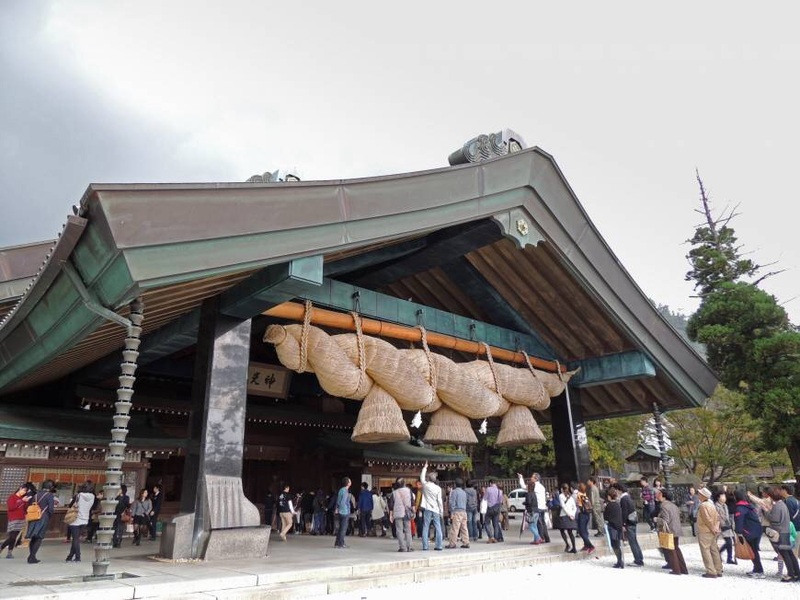 Izumo Taisha has been popping up more and more on Japanese tourists’ collective radar ever since Princess Noriko married the son of the shrine’s head priest in October, joining together two of the oldest family lineages in the country. In fact, the line of the Izumo priests stretches a mind-boggling 85 generations. Indeed, everything about Izumo Taisha is a matter of scale. Visitors first pass through a succession of hulking, dark shrine gates before the final approach down a gentle grade and through a corridor of pine trees. The wide path spans several hundred meters and ends with the abrupt appearance of the haiden (worship hall). The hall’s wide, sloping roof and asymmetrical facade are efficiently humbling. With the clouds closing in, I hurried behind the haiden to get a better view of the massive honden (main hall). This is where Okuninushi is enshrined, and where, according to the Kojiki and Nihon-shoki, Susano’o settled the land after his banishment from the heavens. The current honden, built in 1744, exudes the appropriate degree of authority. It’s difficult to imagine that an earlier, 13th-century iteration rose to a staggering 48 meters. Equally inconceivable is the 13-meter, 5-ton shimenawa, a twisted straw rope indicating sacredness, adorning the kaguraden (kagura hall). I arrived to find a line of people longer than the rope itself jutting out from the shrine, and had only a few minutes to contemplate its mass before the black forms above coalesced and let loose with sheets of cold rain. I escaped the worst of it by finding shelter in the neighboring Shimane Museum of Ancient Izumo. When the storm broke, I walked a short kilometer to the beach at Inasa-no-Hama, where in a few weeks the gods would be greeted for the first day of Kamiarizuki. The sun had just set behind a veil of violet-hued clouds, and the wide beach was empty save for a few ironclad surfers donning wetsuits retreating from the darkening waves. Their footprints resembled ant trails on the otherwise smooth sand, and I was left wondering by what mysterious means the gods transport themselves to this far-flung corner of Japan to answer Okuninushi’s call, and by what divinations they determine our fate. Later that night, I shocked the cold out of my bones at Motoyu, one of two public bathhouses in Yunotsu, the small coastal town that once served as a shipping port for nearby Iwami Ginzan and now enjoys UNESCO World Heritage status along with the mines. Neither bathhouse adulterates the source water, so the milky, 45-degree-Celsius bath is an exercise in endurance. The next morning I hit the other bathhouse in town, the Yakishiyu, whose spring was created by an earthquake nearly 2½ centuries ago, for good measure. Freshly stewed and stinking of sulfur, I made my way to the mines. During its heyday in the early Edo Period, Iwami Ginzan supplied one-third of the world’s silver. Its centuries of use fueled Japan’s warring states period and the Tokugawa Shogunate that ended it. After the Meiji Restoration, the mines were privatized and new smelters were built downriver, but the mines began to run dry within a few decades. For most of the 20th century, the once prosperous region backslid into dereliction, and many of the original buildings were lost to fire. The entire mining area covers 5 sq. km, most of which can be explored freely, but the old mining town of Omori is the real treasure. Hundreds of Tokugawa and Meiji era buildings huddle along a trickling river deep in the valley, and the main drag of Omori Street is a veritable time slip. The pristinely renovated Kawashima Family Residence was originally built in 1825 and is now a museum showcasing the bygone household of the samurai family who administered Omori during the Edo Period. According to the woman who sold me my ticket, more than half of the buildings in town had been abandoned before the area received World Heritage status in 2007. Since then, people have been coming back. Some come just to visit, as indeed Iwami Ginzan, along with the rest of Japan, has already posted record visitor numbers this year. But others come to tap the new revenue stream by renovating historical buildings and transforming them into guesthouses, cafes, shops and eateries. The sinking sun had already cast the valley into shadow as I left the charms of Omori behind. It would be completely dark by the time I boarded the Sunrise Izumo, but at least I’d be headed east to meet the new day. My Nobi Nobi seat was a bit of a misnomer. Borrowed from a term meaning stretch, each berth is about the size of one tatami mat. Sitting upright my head just grazed the ceiling. The floor is hard and thinly carpeted, but mercifully seemed to be heated. A thin white sheet had been folded neatly and placed at the entrance, but no other bedding was provided. Passengers can close a scratchy curtain to the narrow corridor, but the berths themselves are open to one another. As the train lurched into motion, I looked down the row at the dozen or so other travelers silently setting up their nests for the night. This Spartan compartment was to be our shared home for the next 12 hours. It was a small mercy I had the foresight to buy an ekiben (boxed lunch) before boarding, made with fresh crab from the Sea of Japan — the Sunrise Izumo has no snack cart or meal service. I cracked the disposable chopsticks and tucked in as the dark mirror of Lake Shinji glided by outside. A few hours later I was pressed up against the cold glass of the window when we stopped at a tiny, single platform station. Down the row of berths a soft snore — no longer masked by the sounds of the wheels turning over the tracks — grew louder. Looking out, I saw not a soul at what the sign asserted was Nunohara Station. We departed, and the train passed through a dark town somehow unmarred by the neon glow of a convenience store. A little later, the hills gave way to a slow, wide river across which a single car kept pace with the train for a protracted minute, and I wondered if someone inside the car was looking back at me. A full orange moon hung overhead, a third participant in our silent exchange. Then the tracks arced away from the river, the car drifted out of sight, and the moon retreated into an inky black sky. Throughout the night the rocking of the train and the hardness of my makeshift bed tugged me in and out of sleep. When the first glow of dawn began to leak over the horizon I stopped pretending to slumber and instead fixed my gaze on the horizon. However, the name Sunrise Izumo turned out to be a misnomer as well. As the train turned east, the train conductor had the sunrise view all to himself. I was compensated with an impressive view of Sagami Bay as day slowly broke and the sky banded violet and pink before becoming a familiar blue. Getting there: The Izumo Taisha shrine is located in the city of Izumo, Shimane Prefecture. The Sunrise Izumo leaves Tokyo Station at 10 p.m. and arrives in Izumoshi Station at 9:58 a.m. the next day. One-way fares cost from ¥15,320 plus tax. For more information, see www.jr-odekake.net/train/sunriseseto_izumo/index.html.